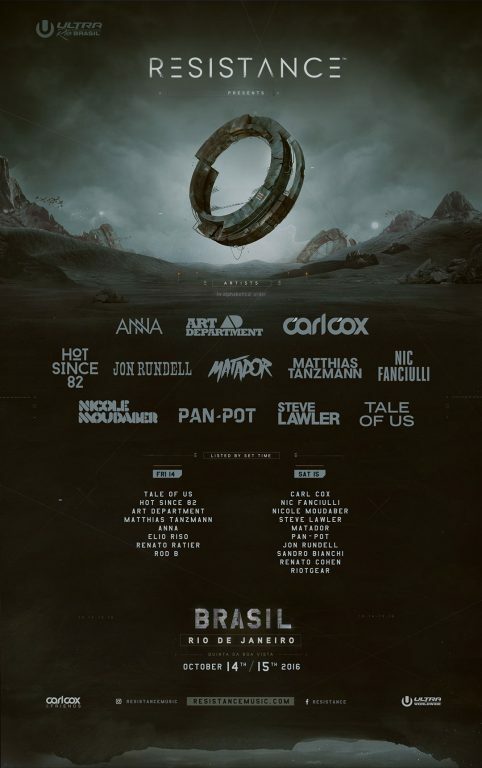 Tale of Us, the legendary Italian techno aficionados, have been added to ULTRA Brasil’s already stacked RESISTANCE roster, and are the last headliner to top the debut edition’s final lineup. With worldwide superstar DJs Martin Garrix, Carl Cox, Above & Beyond, DJ Snake and many more, slated to play over the massive two day festival in Rio de Janeiro, the weekend will undoubtedly bear witness to some incredible performances. RESISTANCE, the newest concept created by ULTRA Worldwide, will be set across both days of the festival, October 14-15, showcasing some of the finest house and techno on the planet. Joining the ranks of Carl Cox, Nic Fanciulli, Nicole Moudaber, Hot Since 82 and more, will be Berlin based DJs Tale of Us, whose blend of swooning house and techno will surely bring crowds in numbers. ULTRA Brasil has invited some of the finest up and coming talent from Brazil and around world to showcase their take on the underground including Elio Riso, Jon Rundell, Renato Cohen, Renato Ratier, RioTGeaR, Rod B, and Sandro Bianchi. Tickets for this historic event are selling at rapid speed, so be sure to grab the remaining few while they’re still available via ultrabrasil.com/tickets. MTV Latin America has announced a partnership with the world’s most independent festival brand, ULTRA Worldwide™, to broadcast and live stream the upcoming edition of ULTRA Brasil, set to take place for the first time in Rio de Janeiro on October 14 & 15, 2016. MTV will host the two-day live stream on its digital platforms in Latin America and Brazil and will also produce and broadcast primetime specials live from ULTRA Brasil on both days. The event will be available to more than 50 million households in 26 countries across Latin America and Brazil, and marks the first time an ULTRA Worldwide™ event will be televised live across the continent. “Electronic music is an essential part of our audience’s lives and MTV’s core values include bringing artists and fans closer together, so this partnership felt natural from the beginning, said Tiago Worcman, Senior Vice-President and Brand Manager for MTV Latin America and Brazil. “MTV will create curated content and also serve as a mirror to give the opportunity to millions of passionate fans to experience the festival in a very unique way”. Leading up to the festival, MTV will fuel the audience with an entire week of exclusive programming including special reports via MTV News, countdowns, daily EDM-themed MTV Hits, and more to be announced at a later date. With events in almost every corner of the world and still expanding, ULTRA Brasil is the twentieth destination of ULTRA Worldwide™. The highly anticipated event will be headlined by electronic music powerhouses including Martin Garrix, Carl Cox, Above & Beyond, Hardwell and DJ Snake, among others.